With less than a month to go, the fans of True Faith are getting more and more excited about one of 2018’s highly anticipated OPM concerts … “Far From Perfect: True Faith’s Senti 25, The Silver Anniversary Show” which will be slated on Oct. 25, 2018 at the Music Museum. There’s just no stopping phenomenal band True Faith from doing what they love to do – that is performing on stage in front of their fans and communicating directly with them through their endearing music. It’s really something to look forward because this is deemed to be a grand Anniversary celebration with their fans and friends in the business. 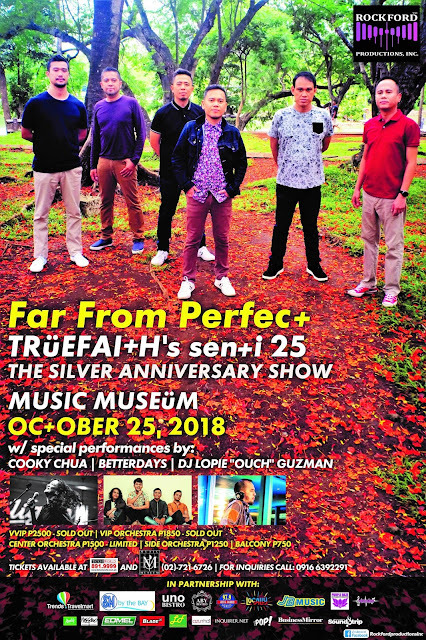 The anniversary show is expected to be very gratifying especially for the true blue True Faith fans as they will be playing songs that are rarely heard in the band’s usual sets in bars and gigs. True Faith promises to do an electrifying lengthy set, filled with excitement and energy throughout the show. As shared by their lead vocalist Medwin Marfil- "musically and visually, it shall be a delight’. Musically - besides having promising OPM and established artists like Better Days, Cooky Chua, and DJ Lopie “Ouch” Guzman as special guest performers, other friends and fellow iconic musicians will be jamming with us on stage as well. The versions of all your favorite Truefaith songs will absolutely sound more brilliant on that night. VISUALLY- the Visual Effects for the show will be designed by the talented filmmaker himself MR. ADRIAN ARCEGA. The show won’t only be a feast for the ears but also a spectacle for the eyes. Siguradong sulit ang concert!" True Faith’s brand new album is aptly titled, “Sentimental”. It is the band’s 10th full-length album. “SENTIMENTAL” features potential hit singles such as “Paano Ka Magiging Akin?” “The Rain,” “Consolation For A Fool,” “Cool Lang,” the MGMT “collaboration,” “Ako at Si Michael” and the latest single, “Kahit Na” - written by Sorsogon Gov. Robert Lee Rodriguez . The music video of “Kahit Na” is directed by Lui Villaruz. It was incidentally was shot in Sorsogon, and can now be viewed on YouTube and MYX. “Sentimental” once again showcases Truefaith’s music as it should be - exquisite, refined and stylish. CDs will be available for sale on the night of the show. The album is likewise available on various digital formats, on iTunes, Amazon, Google Play Spotify, Apple Music and Deezer. Tickets for Far From Perfect concert are selling very fast. Fans should now hurry and grab their tickets! Far From Perfect: True Faith’s Senti 25, The Silver Anniversary Show is presented by Rockford Productions Inc in partnership with: Trends Travelmart, SM By the Bay, UNO Bistro, ABY Bistro, Locally, JB Music, Purple Haze, VENOM, EDMEL, BLADE, Home Radio 97.9FM ,INQUIRER.NET, INQ.POP, Business Mirror and Soundtrip.